A research project examining ways to improve police over­sight agencies made University of Idaho senior Andrea Pikes realize she wanted to dedicate her life to studying relationships between law enforcement agencies and the people they serve. “This project makes you realize what could be done for this outcry that’s going on with the community and the police,” said Pikes, 22, of Boise, a double major in sociology/criminology and psychology in the College of Letters, Arts and Social Sciences. Police oversight agencies process complaints from civilians against the police. Pikes said such agencies are particularly important in the current climate, when some people feel unrest and distrust after officer-involved shootings and other conflicts. She worked with fellow sociology/criminology senior Nicole Waldorf on the project, under the guidance of assistant professor Joseph De Angelis. Waldorf, 22, who transferred to UI from a community college near her hometown in the Seattle area in pursuit of finding her true purpose in life, jumped at the chance to work with Pikes and De Angelis and be part of something bigger than herself. Pikes and Waldorf sent surveys to oversight agencies all over the country to gather information on their practices for handling com­plaints. Over the course of the project, they “read much of the existing litera­ture on police oversight and looked at what those authors have found on what makes these agencies accessible to the public,” Pikes said. Pikes (left) and Waldorf pose with their research mentor, assistant professor De Angelis. Pikes and Waldorf received OUR Travel Grants. Learn more. They learned that having multiple language options on complaint forms, attempts at public outreach, and independent, unbiased locations away from the local police departments for civilians to file complaints are most effective. Throughout the course of their project, they were most surprised to discover how little standardization there is for police oversight agencies, Pikes and Waldorf said, and how even the communities they grew up in are lacking in this resource. Waldorf, who grew up surrounded by family members who were po­lice officers, said she hadn’t been aware of how much police oversight was in need of reform. This need is what helped both women see how this project allows them to make a difference. 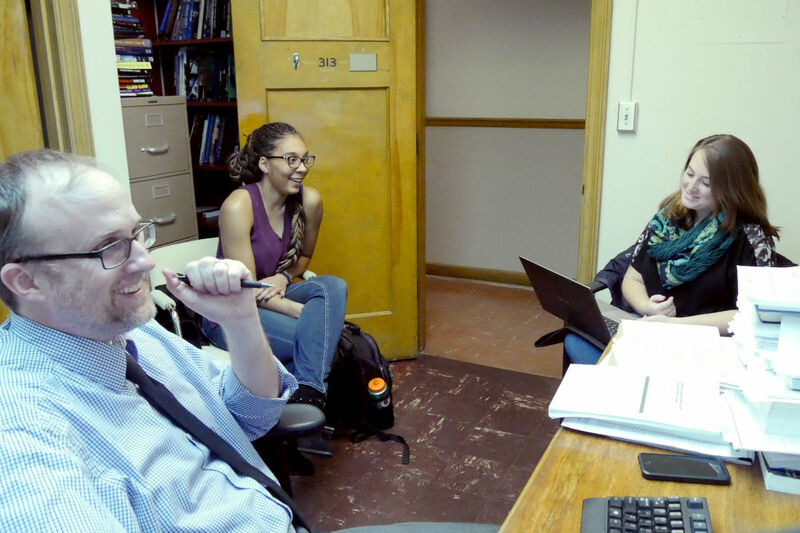 “In today’s atmosphere, relations between communities and the police are really strained, and so to be able to work on a project that has real-life implications outside of the classroom is really important,” Waldorf said. Both women are grateful this project has provided them with the opportunities to learn about their passions and make a difference. 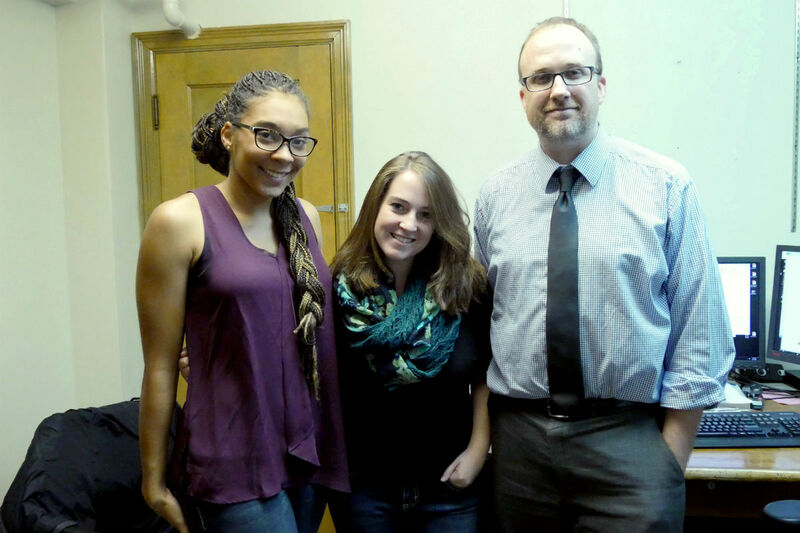 They’ve gotten to learn how sociology can help change the world, they traveled to New Orleans to present the findings of their project and they have even had opportunities for graduate school open up for them. De Angelis, Pikes and Waldorf discuss their work in De Angelis’ office. WRITER: Mary Caraway is a senior from Idaho Falls, Idaho, studying English with a creative writing emphasis. PHOTOGRAPHER: Kara Billington, a junior from Moscow, Idaho, is majoring in broadcast and digital media.